A mother cleared of murdering three of her children says she will not have another child. Trupti Patel, who has one surviving daughter, was found not guilty of murdering Amar, Jamie and Mia following a six-week trial at Reading Crown Court. 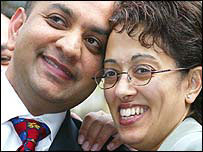 Mrs Patel, 35, from Maidenhead in Berkshire, said she was certain she and her husband would not have any more children. She said she also doubted she would ever return to work as a pharmacist because of the stigma arising from the trial. Despite walking free from court Mrs Patel has a court order barring her from playing with her daughter unless she is watched. She told the Daily Mail: "At the moment, because of my situation, one grandparent must still live with us. "Nor am I allowed to cook for my daughter, serve her food or give her a drink. "Perhaps they think I might poison her. Nor can I bath her or take her swimming without someone else being there." The couple have decided not to have another child following the deaths of Amar, Jamie and Mia. "We just can't take the risk, so Jay will have a vasectomy. Nor does our daughter want another sibling. She says he or she might die," she said. She said parents who lost children due to metabolic disorders needed professional help in deciding whether or not to try for another child. "No one should have to risk being arrested and going through a trial to discover there is something seriously genetically wrong," she said.